Our single rooms at Alpenhorn Lodge offer the ideal place to enjoy a few solo nights R&R. They are perfect for a comfortable getaway at an affordable price. The room consists of a double bed, ensuite bathroom, Tea/Coffee making facilites, bar fridge, and LCD flat screen TV. All linen and towelling is provided. The lodge and the guest rooms are centrally heated. The small double rooms at Alpenhorn offer the perfect solution for a comfortable getaway at an affordable price. These are our entry level rooms and are perfect for a few nights with your loved one. The room consists of a double bed, ensuite bathroom, Tea/Coffee making facilites, bar fridge, and LCD flat screen TV. All linen and towelling is provided. The lodge and the guest rooms are centrally heated. The Queen/Twin rooms at Alpenhorn are configured as either a queen bed or 2 x single beds, perfect for a couple, parent & child or friends sharing. The rooms are centrally heated with ensuite bathroom, tea/coffee making facilites, bar fridge, and LCD flat screen TV. All linen and towelling is provided. Our triple rooms at Alpenhorn Lodge are suitable for a small family, or a group of friends sharing. The rooms are cozy and comfortable with central heating throughout. The room consists of 1 x queen bed and 1 x single bed or 3 x single beds. There's also an ensuite bathroom, tea/coffee making facilites, bar fridge, and LCD flat screen TV. All linen and towelling is provided. Our 2 Bedroom family suite is available for families or friends sharing, who are looking for a bit more space. With an affordable tariffs that include accommodation for 4 or 5 people. The room features a main bedroom with queen bed (or 2 x single beds) and a second bedroom with a bunk bed. The small living room has a fold out double sofa bed. There is a large private ensuite bathroom, complete with bath tub, a separate small living room with 40 inch LCD TV, microwave, sink, tea/coffee making facilities, and bar fridge. All rooms are centrally heated through the winter months. All linen and towelling is provided. Our family rooms are priced perfectly for families or friends sharing, with an affordable tariff that includes accommodation for 4 or 5 people *(Max 4 adults). The rooms consist of a queen bed and a bunk bed, or 2 x single beds and a bunk bed. Some rooms also have a single sofa bed or trundle bed for an additional 5th guest (child). Each room has private ensuite bathroom, tea/coffee making facilites, bar fridge, and LCD flat screen TV, and are centrally heated through the winter months. All linen and towelling is provided. Alpenhorn Lodge continues to offer a friendly atmosphere and great value holidays for which it is now well renowned. 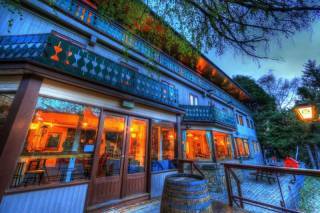 Alpenhorn Lodge is rated three and a half stars by AAA/NRMA and rated #2 on popular travel site "Trip Advisor". Recipient of Certificate of Excellence for 3 years in a row. Our cosy rooms, comfortable lodge facilities and our friendly staff set the scene for an enjoyable, affordable holiday staying in the heart of the village. Our guest lounges offer a place to relax with a book or magazine while the deck offers the perfect afternoon suntrap overlooking the slopes to re-live your latest skiing, snowboarding, hiking or mountain biking feats! There is ski storage/bike storage and a heated drying room for your ski boots and clothes. To extend your skiing time, luggage storage and guest change facilities are available on your arrival and departure days. You can time your visit for Christmas and New Year or one of the special events and festivals in summer such as the Jazz festival or the ever popular Blues festival. Play golf on Australia's highest golf course, bicycle (down the mountain or around the Village! ), fly fish or walk to the top of Mt Kosciuszko and numerous other great walks available in and around the area. In summer our BBQ courtyard is a popular place to read a book. There is also a stream beside the lodge with a grassy bank for those who want a shady spot to retire to. Wireless internet is available at the lodge and throughout the village. All rates include breakfast, while in the peak of winter we offer our guests the convenience of restaurant quality in-house dining, through our very competitive packages. We are fully licensed to compliment your meal with a well earned beverage. 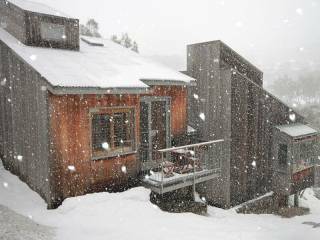 Perfect for couples, families, and group getaways or team building weekends, plan your next Thredbo getaway to include a few nights at Alpenhorn Lodge and see why we are known as "The Friendly Lodge". To confirm your reservation a deposit of 50% of the total cost of the booking, inclusive of all services, must be received immediately upon reservation being made. Failure to do so will result in the booking being automatically cancelled. Final payment must be made sixty days (60 DAYS) prior to your arrival date for winter bookings and thirty days (30 DAYS) prior to your arrival date for summer bookings. If the booking is made less than sixty days in advance for winter and thirty days in advance for summer, payment in full is required immediately. Failure to make the payment by this time may result in the booking being cancelled. Payment can be made by EFT or Direct Deposit, using surname and booking number as reference to: Alpenhorn Lodge, BSB 083 088, Acc No. 197 943 685. Payment can also be made by Visa/Mastercard (a credit card surcharge of 2% may apply). A credit card security bond of $500.00 is required for each room on arrival. Cancellation and Refunds: If a deposit or full payment has been made, cancellation of the booking must be in writing and must be received and acknowledged by Alpenhorn Lodge. Cancellation fees will be charged in accordance with the following conditions, unless otherwise stated on your invoice: 1.) Bookings cancelled at any time after confirmation and up to 60 days prior to scheduled arrival are subject to a cancellation fee of 20% of the total booking cost, inclusive of all services, with a minimum charge of $50.00 per person. 2.) Bookings cancelled between 30 and 60 days prior to scheduled arrival will incur a minimum cancellation fee of 50% of the total booking cost, inclusive of all services. 3.) No refunds will be given for any bookings cancelled less than 30 days prior to the scheduled arrival, i.e. the total booking cost will be forfeited. No allowance or refund will be given for the value of any accommodation, meals, lift passes or any services that you do not utilise during your stay. Amendments to Bookings: Subject to availability and notice period, we will try to accommodate changes in your bookings. A fee of $50.00 will be charged for each variation. This is in addition to any cancellation fee where the length or value of your original booking is reduced. Snow Conditions: We cannot be held responsible for snow or weather conditions. Any cancellation due to snow conditions will be subject to the above cancellation fees. Responsibility: Alpenhorn accepts no responsibility for the accuracy of information provided by any travel agents or reservation services. Alpenhorn reserves the right to alter, amend or cancel the availability and accommodation rates and packages without notice. Other Conditions: In addition to the terms and conditions detailed above, bookings will be subject to any further terms and conditions advised at the time of booking or during the period of your stay. Insurance: Alpenhorn recommends travel insurance to protect you against loss of personal belongings, public liability and cancellation of your reservation (subject to the terms of your policy). From Sydney drive to Canberra then Cooma and on to Jindabyne, then Thredbo. The drive is about 5 hours (plus stops) from the centre of Sydney. 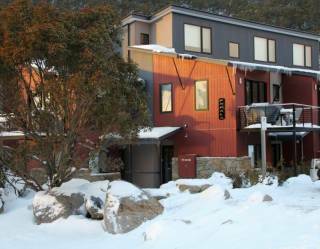 From Jindabyne: Take the Alpine Way to Thredbo, (approx 35km's) and turn right into Thredbo Village (Friday Drive). You reach Alpenhorn by driving along Friday Drive, which heads into the village where you will pass the car parks on your left; chairlifts on your right; go under the overhead footbridge; then pass the Church and Nickerbocker restaurant on your right. The road becomes Diggings Terrace and loops back on itself and traverses back higher through the village. Our reception is on the ground floor, adjacent to the car loading/unloading area. There is ample room for you to check in and unload your car before taking it to the designated overnight parking areas for the duration of your stay. The free village shuttle buses will bring you back to Buckwong Place (Winter months only) or it is about a 5-10 minute walk. If you are arriving after 5 pm just call ahead and let us know. We will leave your key for you at reception. Once you are settled you can relax, open a glass of wine or beer, or sit down with a hot cuppa and start enjoying your holiday!